A rain garden design should provide a way to drain water, typically from roof runoff. A basin design is used to temporarily hold this water until it can soak into the soil. While the original purpose of this design served as a way to contain and filter storm water runoff many homeowners are including a rain garden in their overall landscaping design. 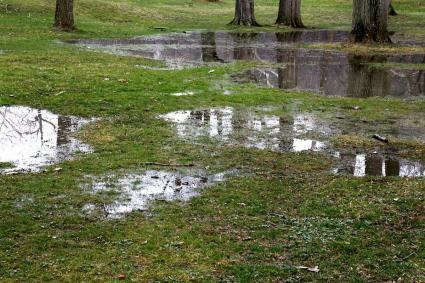 Assess any low-lying areas in your yard. A natural shallow area where runoff, such as water draining from the roof, patio or driveway is an ideal candidate for a rain garden. You may need to berm sloping areas in order to create a level garden. If there is a naturally depressed area in your yard, you might want to use it, as long as it isn't deep. You don't want a deep basin since the water will pool instead properly draining. Not all yards will have a natural basin or depression, so you may need to create one. The ideal depth for a rain garden basin is eight to ten inches and no less than four inches. The University of Minnesota Extension presents practical guidelines for determining your rain garden location. A rain garden should be built a minimum of 10 feet away from your home and other buildings. This will protect your home from the water seepage and damage. Another consideration is the location of a septic tank and drain field. The rain garden should be at least 35 feet away. Also, if your drinking water comes from a well, make sure the site you choose is at least 50 feet away from the well. According to the University of Minnesota Extension (UME), the best way to determine how well water percolates into the soil is to conduct a test. You'll need to dig a hole about three or four feet wide and 10 inches deep. Fill the hole with water until it reaches the rim. Time how long it takes the water to disappear. The ideal is for the water to drain within 48 hours. You may need to try a different site until you find one that passes the 48-hour test. You'll want to determine the appropriate size needed to accommodate the amount of runoff. The University of Minnesota explains that the average size of a rain garden is between 100 and 300 square feet. 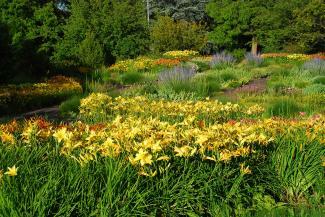 A rain garden calculator can assist with a more precise determination of garden size required. 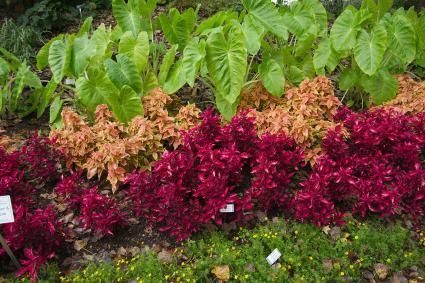 The amount of water being drained into your garden determines the size needed. The UME advises, "Gardens will handle the runoff from a hard surface that is about three times their size." This includes, roof, patio, driveway or other hard surfaces. Once you determine the size needed, you can select the shape for your garden. If you're going for a more natural look, consider integrating your rain garden with your other landscape plantings. You also need to decide if the garden will be a formal or informal design. 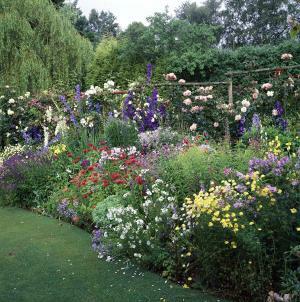 A kidney-shaped garden is one of the most popular choices. A circle or rectangle shape can be used as a focal point in the yard. A long or curved strip can also be integrated into your overall landscape design. Find out the type of soil you have. Determine if the soil is sandy, silt, clay or loam and make adjustments/amendments so it has good drainage. Sand helps clay and silt drain better, while clay and silt prepare sandy soil for growing plants. Fill the basin in the following order for best results. The first layer of the basin bowl is the underdrain gravel/sand, followed by garden soil, then the plant in what is called the pooling level. If your garden location has a slope, you may need to berm the sloping side, so the garden is level. Use landscaping materials, such as rock and edging to contain the soil, especially the bermed area. 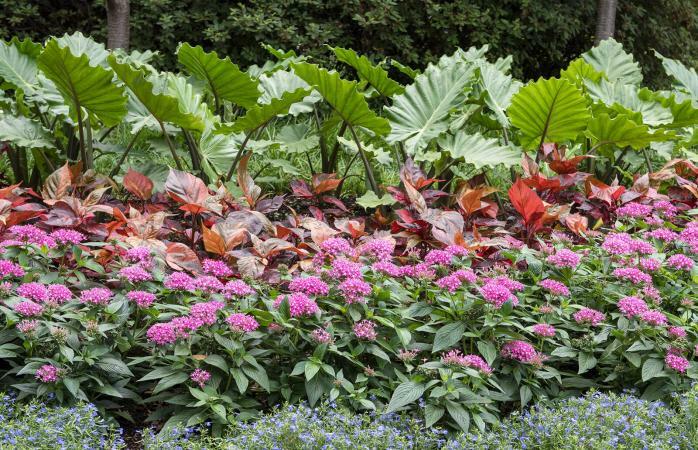 Select plants that are suited for the moisture of a rain garden and amount of sunlight your garden provides. Should you decide to build more than one rain garden, you can use the same plants to add depth and continuity to your yard. You can redirect water from gutter downspouts by installing flexible drainpipes that lead to your rain garden. Other runoffs from patios and driveways can be redirected using a berm (small mound of dirt, rocks and plants) or a French drain (gravel trench for pipes with holes). Plan out your rain garden design the same way you would any garden, but with considerations for basin criteria, drainage and other aspects noted above specific for this type of garden. Personalize it with aspects that fit your garden preferences, but keep in mind that the best gardens are the ones that blend in with existing landscaping.